Down syndrome is a chromosomal based disorder that occurs during gestation. About 1 in 830 newborns have this disorder. Humans have 46 chromosomes in each cell that are divided into 23 pairs. A change in the chromosome 21 pair (from which each parent contributes) has been found to be the cause of many types of cancers and of Down syndrome. Down syndrome usually occurs when each cell has three copies of chromosome 21 rather than the normal two copies (a condition that is referred to as trisomy). The impairments resulting from Down syndrome are both mental and physical. On the mental side, the chromosomal defect causes cognitive delays that result in a reduced intellectual functioning. The reduced functioning is mostly mild to moderate. On the physical side, the defect produces weak muscle tone in infancy and a characteristic facial appearance. According to the National Institutes of Health, about half of all affected children are born with a heart defect. Unfortunately, the defect does not stop there. The cognitive delays may cause speech and language issues along with behavioral issues. As a person with the syndrome ages, his/her ability to think may decrease sooner than people who do not have this syndrome. For people who have Down syndrome, this decline in thinking ability could begin as early as age 50. A person with Down syndrome is also at greater risk to be afflicted with Alzheimer disease and this affliction may occur earlier in age as compared to those who do not have Down syndrome. 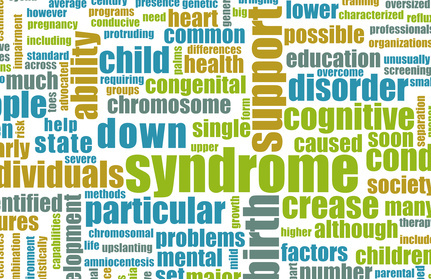 The Social Security Administration has listed Down syndrome as one of its Congenital Disorders that may qualify for Social Security Disability benefits. The requirement that must be met in order to qualify for this particular listing is that a person must have non-mosaic Down syndrome. This particular variant of Down syndrome must be proven by a laboratory test, called a karyotype analysis, showing that the person has non-mosaic Down syndrome. If this laboratory test does not establish Down syndrome, then the diagnosis of Down syndrome may be established by a physician indicating that the type of Down syndrome is consistent with prior karyotype analysis and that the person has distinctive facial or other physical features of Down syndrome. If there is no prior karyotype analysis, then a person may qualify for Social Security Disability benefits if there is a physician’s report stating that there is distinctive facial or other physical feature of Down syndrome and also that, in the physician’s opinion, there is evidence that the functioning is consistent with the diagnosis of Down syndrome. It is important to note that even though this syndrome is devastating people with Down syndrome are valued and active community members. Today, the average life span of a person with Down syndrome is 60 years of age. This is significant because in the 1980’s the average lifespan of someone with Down syndrome was around 30 years old. In 1959, the average lifespan of an individual with Down syndrome was only 9 years old. To find out what options you have, you should consult with an experienced disability attorney to discuss the repercussions that come along with the various decisions that confront you. Click here to contact a Ted Smith attorney or call 800-296-2290 to schedule a free consultation.